I turn at the American Book Centre, following the guidebook instructions. There are several other tourists there, standing before a heavy wooden door. One of them steps forward and opens the door. We pass through a doorway and a passage passing under the houses, and emerge in the absolute peace and calm of a hidden, inner courtyard. Suddenly, it’s quiet. The noise and chaos and people of Amsterdam fall away. I stop, with several others, to read the plaque. Some wander around quietly. On the lawn stands a statue of a woman, dark against the green grass, the autumn leaves and the brick of the church. The plaque tells the stories of the Beguines. Beginning sometime in the twelfth century, groups of women in the Low Countries and later Germany and France chose to come together to live as a religious community, primarily to care for the sick. They were single, Catholic women who were not nuns but chose to live away from the roles they would probably have been expected to assume otherwise (wife, mother or cloistered nun) in this lay community of faith. They took temporary vows of chastity and obedience but were able to end those vows at any time and leave the community. They did not take vows of poverty and so were able to keep their own possessions, which (the guidebook suggests) helped to preserve the Begijnhof (Beguinage) in later years when the property of the Catholic Church in Amsterdam was seized by the state. These women lived in the houses around this courtyard over hundreds of years. In the middle of the courtyard stands a stone church built in the 1400s. All the houses, rather than facing the busy streets, look down upon this church. The church, in its courtyard, would have been the centre of these women’s lives. The wooden houses and the original church building were mostly destroyed in the Amsterdam fires of 1421 and 1452 but the Beguines rebuilt, this time building brick homes for themselves – one of the old wooden houses has been restored to show what the original homes would have looked like. The Beguines also paid for the rebuilding and restoration of the church themselves. In 1578, Roman Catholic Amsterdam was converted by the “Orangist Calvinists” to be a Protestant city. Catholic magistrates were dismissed and it was forbidden (until 1795) for Roman Catholics to openly profess their faith. All churches, monasteries and convents were confiscated by the authorities. 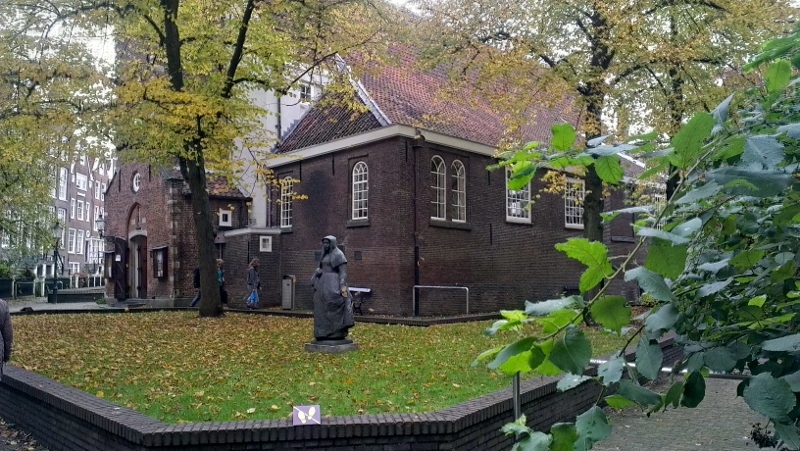 The church in the courtyard of the Begijnhof was handed over and was given to the English speaking population of Amsterdam as their Protestant Church. Although the Beguines had handed over the church they had built and rebuilt, the houses were the private property of the women, so the government did not try to confiscate them. 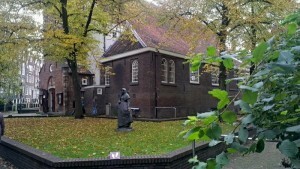 The community around the courtyard remained and the Begijnhof remained a Roman Catholic enclave in Protestant Amsterdam for more than 200 years, an enclave where these women quietly practised their faith and cared for others in spite of the political upheaval and religious intolerance that raged beyond their walls. The women now worshipped in a small “house-church” in two a-joining houses. One of many hidden churches in Amsterdam. In 1671, with the permission of the municipality, they were finally able to build a proper chapel on this spot. The current chapel opened in 1682. At the time, 150 Beguines and 12 widows or single women lived in the Beguinage. The last member of the Beguine community or sisterhood at the Begijnhof in Amsterdam passed away in 1971, the last of many generations of women of this community over almost 800 years. Although the community no longer lives here, still only single women are allowed to live in the houses and both the protestant church in the centre of the courtyard and the Catholic chapel remain in use. A major renovation (and restoration) was carried out in the 1980s and the property handed over to the Beginjhof Foundation, who maintain the property and rent out homes to 93 single women. It is one of the most peaceful places I have ever visited. Both the church and the chapel continuing to be places of worship, away from the bustle and noise of central Amsterdam. The chapel is part of the annual celebration of the Miracle of Amsterdam. Begijnhof is a sanctuary of peace. There were other tourists there when I visited, lighting a candle in the Catholic chapel, lingering in the Protestant church where the organist and the soprano were practicing hymns, praying, resting or just taking it all in. Walking along the path around the church I came to the second doorway and stepped out into the street. It felt like I’d walked into a wall of sound. It felt so strange, so unnatural. I stepped back and went back into the courtyard. I wasn’t ready to leave this peace just yet. I wasn’t ready to step back into the world. There are many wonderful things in Amsterdam and I loved visiting. But the reason I would go back, the reason I find myself drawn to the craziness of inner city Amsterdam, is Begijnhof.